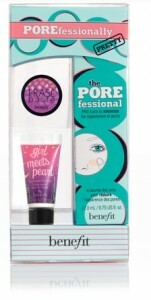 You heard it here first, Benefit are currently offering a fantastic box set bargain which includes their new POREfessional primer (full size), a mini Girl Meets Pearl highlighter and a mini Erase Paste concealer. If you still aren’t sure why you need to be excited by this – the breaking news is that the entire kit comes in at £23.50 – exactly the same price of the POREfessional primer when purchased individually. This aptly named primer is all about the pores! The idea is that the silky smooth balm sneaks its way into your pores and fine lines and gives the complexion a smoother than a babies bottom appearance. The balm can be worn alone, under make-up, or over make-up and is even suitable for oily skin tones. This has to be way up their in concealer royalty – with its super thick and creamy formula Erase Paste is a one stop shop to a brighter and clearer looking complexion. Even though this is a mini size, a little really does go a long way with this product so say hello to perfect looking skin and bye bye to dark circles and blemishes. This highlighter is a dewy and glowing complexion lovers dream. Mix in a little with your foundation for healthy looking daytime skin or use alone as a highlight on top of your make-up on the cheekbones for an evening look. Also great when used sparingly under the brow as a highlight. Pop on over to the Benefit website to pick up the POREfessionally Pretty kit, at such a steal it would be rude not to surely?